In the Edo era, era just before Japan came under imperial system, the Japanese did not have the custom to eat meat. Instead of meat, the source of nutrition for the common people were “Dojyo (Loach)”. 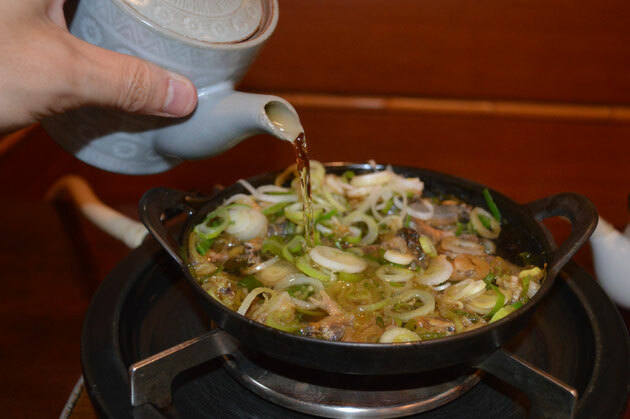 After the wide spread culture of eating meat, there are only 4 restaurants were you can eat loach sukiyaki in Japan. “Dozeu Iidaya” is one of them. Dozeu Iidaya is found on 1903, a restaurant with history of more than 100 years. There are many Japanese tourists coming to this restaurant too. The photo of the loach sukiyaki is 1500yen, and during lunch time, it comes with rice, soup, and salad for 2000yen. You can choose the loach with bones or no bones. So you should choose with bones if you want to enjoy the wild taste, and no bones if you don’t like to eat hard stuff. The taste is sukiyaki, sweet soy sauce taste. The green cylinder and the red cylinder in the picture are Japanese pepper and red pepper. Sprinkle a little and enjoy the spice. Deep fried loach and Tuna are also good to eat, and chilling out drinking sake is also a good way to spend time at this restaurant. The restaurant has a quiet and traditional ambience, and the service by the staff is friendly. You can experience “Omotenashi”, the Japanese way of serving customers. Nearest Station : Tsukuba express ""Asakusa Station""